A planet shrinking over a few thousand years, wrinkling like an apple. Vast underground caverns filled with seawater that rises to the surface to form oceans. Volcanic eruptions powered by coal beds. All of those sound like ridiculous ideas in this day and age, but just a few hundred years ago, they represented some of the best available theories about the origins and dynamics of the Earth. 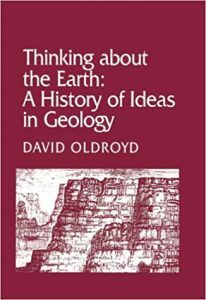 Thinking about the Earth, by earth science historian David Oldroyd. This has all been on my mind recently, as I’ve been reading a book called Thinking about the Earth by David Oldroyd. It offers a brief but comprehensive history of Western ways of thought in geology, starting with ancient Greece and ending near the present day (full disclosure: I’m still reading through the mid-1800s, but I do already know how it ends). Part of the fun has been learning about all the strange explanations people came up with to try and make sense of the natural world within the religious and scientific frameworks of the time—Biblical timescales! Fossils from a Noachian flood! But just as interesting as the ideas themselves is learning about how those ideas changed: the people, processes, evidence, and experiments that got us from there to here. Take, for example, estimates of the age of the Earth. The physico-theologists started by counting generations backwards through the Bible and came up with a six-thousand-year-old planet. Breaking from that Mosaic timeline could not have happened without the social changes that allowed people to challenge the literal authority of the Bible. But some novel experiments measuring the cooling rate of metal spheres also helped by giving people a way to think about the possibility that a planet could be much older (those experiments only got us to 75,000 years, though some scientists privately speculated that Earth might be as much as a few million years old). Abraham Werner and his students thought that the order and type of layered rocks was the same everywhere on Earth. Progressing past that depended on field observations from places other than Werner’s stomping grounds, and also on Hutton’s musings on the erosion of farm fields, which led to the rise of uniformitarianism (the processes which formed rocks in the past still operate in the present) over catastrophism (Earth’s history is a series of unique, catastrophic events). 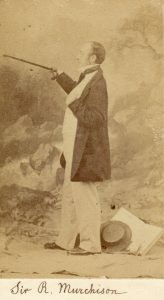 Sir Roderick Impey Murchison made important contributions to early geologic mapping efforts and was part of early efforts to build a geologic timescale, but Murchison also obstructed progress by trying to assign as many rocks as possible to the Silurian time period, which he had named and “founded” (the Silurian is now defined 443-416 million years ago, though Murchison wanted it to cover a lot more temporal territory). The geologic timescale could only be properly ordered when mapping and fossil classifications had been done—and also when Murchison and his protege Archibald Geikie were no longer around to talk over anyone who wanted to mess with their Silurian territory by studying, say, the adjacent Ordovician time period. In short, the story of these ideas is non-linear, lurching and winding through a series of mistakes and revisions as scientists built up both the data and the models needed to approach the truth. Of course, this mode of scientific progress isn’t unique. The nice thing about geology, though, is that it’s a relatively young science—at least in its modern form—so we have ample documentation of both the theories of the past and the people who came up with them. The history of physics, a more venerable discipline, is riddled with apocrypha like the tale of Archimedes and his “Eureka!” moment in the bath; but in geology we have written records backing up stories like that of geologists at the the 1849 British Association meeting literally giving three cheers for Murchison as the “modern King of Siluria” (Woodward 1908, p. 169). The struggles, wrong turns, serendipitous discoveries, outsize personalities, and scientific catfights are all preserved in the literature. Sir Roderick Impey Murchison, the so-called King of Siluria. In the present day, it’s tempting to say that scientific progress no longer takes such circuitous paths to new ideas. We might think that we’ve got things mostly right, now, and improvement is more a matter of going around what one of my professors calls the “geophysical bootstrap”: model, predictions, tests, new evidence, adjust model, repeat. And that may be more or less true—I certainly don’t get the sense that we’re headed for a repeat of the plate tectonic revolution anytime soon. But I think it’s worth remembering that scientists had to completely break and rebuild their models for the world many times over to get to this stage in the history of geology. Murchison would probably be upset that the timescale has changed since his day, and the Ordovician has been allowed to encroach on his Kingdom of Siluria, but that kingdom never really existed in the first place. No one person gets to rule over the geologic timescale, because no one person brought us from physico-theology to modern geoscience: it’s all a group effort, built and rebuilt by the work and ideas of a scientific community. It’s been a republic all along. Lapworth, C. (1885). “On the Close of the Highlands Controversy.” Geological Magazine (Decade III) vol. 2, issue 3, pp. 97-106. Murchison, R. I., Sir (1854). Siluria: A History of the Oldest Rocks in the British Isles and Other Countries. J. Murray, London. Oldroyd, D. R. (1996). 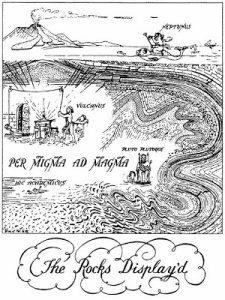 Thinking about the Earth: A History of Ideas in Geology. Harvard University Press, Cambridge, MA. Oldroyd, D. R. (1990). The Highlands Controversy: Constructing Geological Knowledge through Fieldwork in Nineteenth-Century Britain. University of Chicago Press, Chicago. Read, H. H. (1957). The Granite Controversy: Geological Addresses Illustrating the Evolution of a Disputant. Interscience Publishers, Inc., New York. Woodward, H. B. (1908). The History of the Geological Society of London. Longmans, Green, and Co., London.